Hi. My name is Liz. I’m a chip-aholic. Once I start eating them, I can’t stop. And I have a tendency to do this over and over again. It can be tortilla chips, brown rice tortillas made into chips, unsweetened banana chips, sweet potato chips, chips made with black beans. You name it. I eat them like they’re going out of style. I’ve been known to have to smash them and throw them away to stop myself. I can tell you how it all started. In my twisted ‘rules’ of what I will and won’t eat, in an odd way, corn tortilla chips fall into the acceptable category. They have minimal ingredients — corn. No sugar, no wheat, no dairy or other animal products. I’ve long overlooked the part about them being fried because they’re often one of the few things on a menu I’ll eat. For me, the draw is the crunch. At least that’s the only conclusion I can truly reach. After all, it doesn’t matter if they’re unsalted chips, or fruit chips. I’m an equal opportunity chip inhaler. I’ll be honest, it could also be that they’re usually carbs and, well, I do love my carbs. So, in an effort to break myself of this habit, I set out to dig a little deeper into the nutritional, or should I say non-nutritional, value of chips with the hopes that these facts will be the lynch pin to get me to put the chips down. Let’s start with fruit chip. They sound healthy. After all, they’re fruit … and fruit is healthy. And, I don’t eat the sweetened ones so there’s not that whole added sugar issue. Well, I did some research and here’s what I learned about those ‘healthy’ fruit chips. Let’s start with the ingredients. In addition to the obvious, bananas, the ingredients also lists coconut oil and “Natural Banana Flavor.” Any time I see something that says ‘natural [fill in the blank] flavor’, I have to ask why that’s there and what does that really mean. Also, because I still go light on oil any time I use it, it concerns me just how much coconut oil has been added to get them that crunchy. Translation: it’s probably a lot. Then there’s the nutrition facts. Fat: 10g, Carbs 16g, Sugar 1g, Protein 2g. FOR 1/4 CUP! And of those fat grams — 9 are saturated fat … the stuff known to cause heart disease and all kinds of other bodily harm. 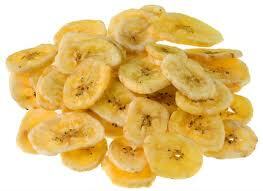 So those bananas you think you’re eating, they might as well be french fries. Then there’s the part about them being fried. If you stop and think about what the raw foodies preach – that any cooking over 112 degrees destroys the nutrients, it’s pretty safe to say that when a banana is taken, coated in oil, and made crispy, most, if not all, of the nutritional value has been sucked out of it. So, here’s the down and dirty in my opinion… eating bananas may not be quite as bad as eating french fries or potato chips, but they’re really not much better. 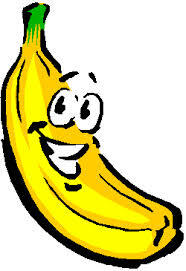 Fact is, you’re much better off eating a fresh banana! Blue corn. Organic corn. Added flax. Whole grains. Beans. The chip industry has certainly caught our attention with making chips sound healthy. First, the positive news. For the most part, ingredient-wise, they’re not too terribly bad. They’re corn. My only recommendation would be to choose ones that really are just corn — even better if it’s blue corn — but stay away from the ones that have a lot of other preservative-like and refined ingredients, including sugars. Now, the bad news. In case you were wondering, they’re fried (at least most of the time). And, as we all know, fried anything is unhealthy and just because they’re not called ‘fried chips’, they’re still unhealthy. 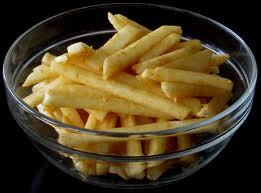 Here’s what happens, in order to fry foods, oil is heated to super high temperatures. In the process, the chemical structure of the oil is altered. The result is a substance that not only has zero nutritional value, but the body can’t even figure out what to do with it. And, when I say that, I mean the body doesn’t know anything good to do with it, because bad things do happen. Heated fats increase the free radicals in the body, which cause inflammation, which destroy tissues, which lead to diseases. Anti-oxidants can help, but probably not enough to completely counteract daily chip chomping. And, P.S., this goes for sweet potato chips too. Sorry! So, now that I’ve gone and ruined the fun of eating chips, I do have a few suggestions that, ok, may take a bit of adjusting before you get excited about the swap, but are good, and healthy, and will soon become your new crunchy favs! 2. Make your own sweet potato chips or ‘fries’. Slice into thin chip shapes or like fries, toss with oil (ideally one that’s good at high heats) and bake until the desired crispiness. You can also do the same with zucchini, parsnips, eggplant, beets or radishes. 3. 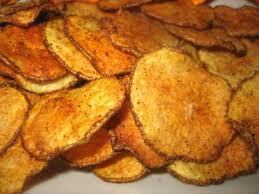 Opt for Baked Chips! 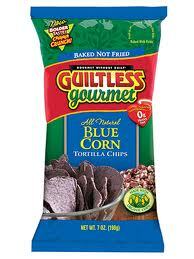 Guiltless Gourmet are my personal favs. 4. Carrots and Hummus. Not only are you getting the satisfaction of a good crunch, but you’ll also get fiber and protein. 5. Kale chips. Super high in nutrients and you can go as fancy or as simple as you want depending on the type of oil and seasonings you use. 6. My personal favorite… Brown rice tortillas, baked for a few minutes at 325 to get ’em slightly crispy then top with almond butter. Or, before popping in the toaster oven, spritz with EVOO and top with garlic powder and cumin. And, of course, there’s always raw almonds! Now, the big question… what to do with those two bags of chips sitting in my pantry…. But, what happens when living in the moment and breaking your own rules push you past your edge? That’s when it’s time to re-center yourself and remember that as long as no one got hurt, wherever you are is okay and you’re perfect just the way you are — and there’s nothing like a good yoga practice to help you do so. It’s easy for us to lose ourselves sometimes, to get caught up in the moment, and to behave in a way that maybe we’re not proud of. I don’t care if you’re 21, 31 or 41, we’re all constantly trying to figure out who we are and where we fit into this crazy world. Life is a bit of an experiment. Sometimes you’re successful in proving your hypothesis and sometimes you blow up the lab — or at least cause a little bit of smoke and flames. When this happens, it’s so easy to beat ourselves up, to hide under the covers, or to blast Pink or Kelly Clarkson tunes (not that I know anything about that… ). But, I’m here to tell you, that’s not the answer and all it’s going to do is push those emotions further down. So, here are my suggestions. 1. Roll out your mat. Just do it. And sit. Close your eyes and breathe. I mean really breathe. Long, deep breaths. Challenge yourself to breathe in for a count of six and out at the same depth and length. Turn your eyes in to the third eye. Focus on the breath and forget the thoughts that have been swirling around in that head of yours. 2. Move. Get the energy flowing. It starts with sun salutations, or even half sun salutations. Just something to open the energy channels that are probably pretty blocked at this point. Start building internal heat. 3. Open your heart. As if just getting yourself on your mat wasn’t hard enough, let me be the first to warn you. This is really hard. Today I did something that seems like it would be the easiest thing in the world, but it was super hard – and even physically painful. Lie down on your back and place a block on its edge at the tip of your shoulder blades. With your arms out to the side, try to relax your shoulders towards the earth and feel your heart open. With every exhale, feel your shoulders relax more and your heart continue to open. Be in the moment. 4. Continue moving through your practice with attention given to opening your heart as much as possible. You can do this in relatively simple positions like downward dog or even lunges as well as more advanced postures like backbends. 5. Figure out where you hold your tension. Is it in your thighs? Your hips? Your back? Breathe into that spot and get the energy flowing! There are not many guarantees in life, but one thing I do guarantee is that if you do this, you will feel better. You will remember that rules are random. They’re machinations of our mind and sometimes they’re necessary, but sometimes they can also make us feel as if we’ve done something wrong, when we’re just doing what felt right at the moment. Accept yourself. Love yourself. Yoga will help you do that. You hear it all the time when it comes to fashion. Add a pop of color. Wearing a LBD? Add a pop of color with red heels! Sticking to neutral colors? Throw on a chunky colorful necklace! Wearing white? Add a hot pink belt! I used to define my life as beige. I didn’t realize it at the time, but everything in my house was beige. Even the art on the wall was shades of beige. My wardrobe, too, was pretty void of color. Mostly black and white, and the few items I did have that were colorful, well, those were mostly relegated to either the back of the closet, or sat on the bottom of a pile, teasing me… daring to be worn. For many people, this same description can be used to describe their food. Lots of beige – or, even worse, white. White rice, white sugar, white potatoes, white bread. Maybe you’re intrigued by the colorful foods in the produce aisle. You buy them, bring them home, and they sit, getting pushed to the back of the drawer like the red sweater in my closet does. But just like the fashion industry knows the power of a pop of color — clearly nature does too, because that’s where the health benefits are! The brighter the color of the food – and we’re talking real, nature-made color, not artificially added color like Peeps – the more health benefits. And getting that pop of color in your diet is so easy to do! So, let’s run down the rainbow of super pretty super foods and how you can incorporate them into your diet. 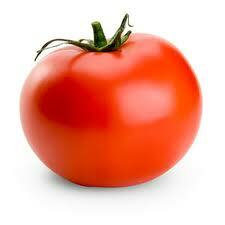 RED: Tomatoes. Super high in antioxidants, especially the heart healthy lycopene. While I’m personally, not a huge sandwich eater, if you are, put tomato on your sandwich, even better, slice some up in a salad. Throw some sliced tomato, cucumber and avocado in a bowl with some salt, pepper and EVOO and you have a refreshing and satisfying snack or pre-entree delight. Personally, I love, love, love grape tomatoes and eat them like a snack. Tomatoes do come with a bit of warning, though. 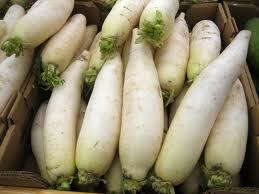 They’re in the category of foods known as nightshade vegetables, along with eggplant and potatoes. These have been linked in some research to impact the muscles and/or joints and are not necessarily for everyone. If you notice you don’t react well to them, find another red food like red peppers to incorporate in your diet. Strawberries are also a great choice for red food. They’re at the top of the list for antioxidant levels in fruit. Eat them fresh as snacks, add to a spinach salad or freeze them and add to smoothies. You can also throw them in the blender to liquify them a little. To me, that’s even better than sorbet! If you’re a juicer, I encourage you to try watermelon/strawberry juice. It’s heavenly!! ok… I’ll stop here with the red foods and move n down ROY G. BIV…. ORANGE: Sweet potatoes are a great source of orange food! 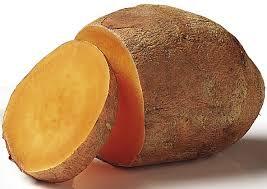 There’s nothing like sweet potatoes for beta-carotene and vitamin A. To get the maximum beta-carotene benefits, add a little fat like coconut oil or extra virgin olive oil These are great just steamed or baked. I personally love to make sweet potato fries with a little cinnamon. Just slice it, toss it with a little oil, and throw them in the oven on a baking sheet at 350 for about 40 minutes, flipping them half way through. GREEN: This goes without saying that leafy greens and green veggies having incredible nutritional benefits from antioxidants to iron. 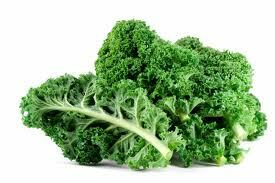 My newest obsession is kale salad – rip up some curly kale, add a shake of salt to break it down a little, squeeze some lime juice, and add either a bit of tahini or avocado. I add grape tomotoes or sundried tomatoes and some raw sunflower seeds and seriously can’t get enough of it. Not a kale lover (yet), steam or roast broccoli for a side dish or to add to some brown rice, keep cut up raw broccoli on hand to dip into hummus, snack on raw green beans or snap peas during the day, add edamame to your salad or whole grains. Green foods may not only be the healthiest, but they also may be the easiest foods to eat every day! BLUE: Blueberries!! Need I say more. They’re so high in antioxidants (there’s that word again). 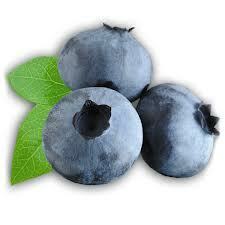 I get that blueberries can be expensive when they’re not in season and that can be a deterrent for some people. If that’s the case, buy them in large quantities when they are in season and freeze them. My mom enjoys them straight out of the freezer, but they can also be added to smoothies or a green juice. PURPLE: OK, I admit it, I”m taking the easy way out and combining indigo and violet in the rainbow, but, really, does anyone really know the difference?? 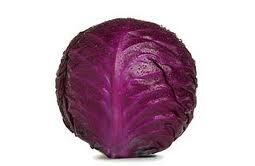 Purple cabbage. It’s probably something you think of more as decoration in a salad or on a plate than something you would eat by choice. But, I promise, it’s really good for you and good tasting! I’ve recently started adding it to my kale salads, but you can also use it like taco shell. Take one of the outer leaves and add some brown rice, black beans and guacamole. Wrap it up and you have a hand-help delight! With all of these amazing options, there’s no reason to eat a beige plate again!! Not to mention, it’s so much prettier to look at! As a kid, I went to camp in northern Wisconsin — Camp Marimeta in Eagle River, way, way up there! Those are days I will never forget — horseback riding, color wars, trampoline and good times with good friends. The camp was on a lake, the scene of canoeing, kayaking, sailing and swimming — and in all those activities, I remember one thing… the seaweed! When I think of seaweed, the first thing that comes to mind is the muck at the bottom of Lake Meta. But then there’s the seaweed that you get in Japanese food. Not exactly the stuff on the bottom of the lake, or even the stuff that washes on the beach from the Ocean. The seaweed you probably know from eating sushi is better known as Nori. Nori is from the red alga genus Porphyra, including most notably P. yezoensis andP. tenera. Before we see it wrapped around rice and raw fish, it goes through a process of shredding, drying and, most often, flavoring and toasting. Nori may not seem like much, but it’s actually super high in nutritional value. That thin, paper-like black stuff is high in protein, iron (vital for blood health), fiber and vitamins A (important for eyes, skin and teeth), C, K and B — especially B12 which can be lacking in many vegetarian diets. Seaweed is also high in iodine which is necessary for a functioning thyroid. It also has zero grams of fat and very low calories for each sheet. Because of its high mineral content, seaweed, along with its other sea veggie friends like dulse, kelp, wakame and arame, are often considered superfoods. Or … jump on the seaweed snack bandwagon! It seems these days you can barely walk down an aisle at an organic grocery store like Whole Foods without bumping into a display of Annie Chun’s Seaweed Snacks or, more recently, Sea’s Gift brand. Annie Chun’s comes in four flavors (although I’ve only seen the first two listed below at Whole Foods). And, in case there was any doubt, they’re all vegan. I haven’t had Sea’s Gift yet, but I did stock up on Annie Chun’s when they were 10/$10 at WFM and I gotta say, it’s a tasty mid-afternoon treat! I tend to crave salty, and it definitely hits that need and while I’m munching away, I can at least know that even though my snack tends to attract a few odd looks, I know that I’m eating something that’s good for me. And, the other really appealing part, is they come in snack size packets, so keep a few in your drawer at work, and instead of reaching for salty chips high in fat and calories, reach for a little seaweed! We all have something about our physical appearance that we’d like to be a little different. Heck, there’s a reason the beauty and makeup industry rakes in billions upon billions of dollars each year. They thrive on the knowledge that people are always looking for ways to brighten their appearance, fight wrinkles, boost their glow, cover this, accentuate that, etc, etc. For me, the problem area is my eyes — specifically the dark circles under them. I’ve always been convinced that, to some degree, they’re hereditary and I’ve tried everything, I mean everything, to cover them up. I’ve tried expensive creams, cheap creams and just about every brand of cover up at Sephora, department stores and MAC. Lately, they’ve gotten worse, so I’ve been doing some research to figure out the causes and some potential treatments. Get 8 hours of quality sleep. Drink 8-10 glasses of water. Cut back on salt, caffeine and alcohol. Put down the fried and fatty foods. Increase your intake of iron rich foods. Considering I do these (at least most of the time) and don’t see a difference, I decided to do a little more research. Preparation H hemorrhoid cream (seriously). It constricts blood vessels and supposedly makes the hue a little lighter. Being not overly excited about these options and preferring to get to the root of the problem which I generally believe comes from something going on inside and just manifesting itself on the outside, I wanted to see what Chinese medicine says about the purple tint under my eyes. Chinese medicine teaches that darkness under eyes is related to the kidneys – usually some sort of deficiency. Chinese medicine doctors don’t actually use the eyes as a diagnosis of kidney issues, but the two seem to go hand in hand. A weak kidney is often the result of exhaustion and when the balance is off, you need to take steps to even things out. There are also foods the kidneys don’t particularly like. 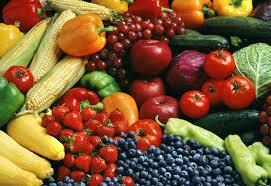 These include cold foods and raw foods – even raw vegetables. If you suffer from kidney deficiency, you want to lightly steam them. Milk thistle, dandelion, marshmallow, artichoke, cornsilk, horsetail, burdock root, parsley, and uva ursi leaf. Unfortunately, like just about anything else that requires the body to come back into balance, none of this is likely to be a magic bullet and work overnight and will require patience. I intend to give some of these options a try – starting with a kidney support supplement or tincture – and will be sure to let you know if I find any success! Do you have a solution that’s worked for you? I would love to hear about it!! One of the aspects of taking classes with amazing teachers is the little nuggets they share during class that just manage to hit home. Sometimes it’s the intention-setting talk at the beginning of class or a poem read to seal the practice. But, other times, and seemingly even more often, it’s something the teacher says off the cuff in the middle of class, not really knowing that one little comment is going to have a profound impact and stick with someone, be shared with others, or serve as a light bulb that sparks additional thoughts and epiphanies for days or even weeks and years to come. That line for me this week was by Marc Holzman on YogaGlo. It was a class about action. This was the third in a series of classes he did a few years ago about focusing on the three A’s of Anusara. Attitude, Alignment, Action. I’ll paraphrase (mostly because I can’t remember exactly what he said and I’d hate to totally butcher his powerful message). Thoughts and intentions without action might as well have never existed. It’s a theory I’ve thought about many times but have never really expressed quite as eloquently as Marc did, and, admittedly, I have never been very good at putting into practice — which is the bigger problem. Call it a lack of self importance or some other feeling of intimidation, but for as long as I can remember, I always had really good intentions and would think about friends or loved ones often, but then I turned into the kid who just wouldn’t go to a birthday party, or play after school, or send a birthday card… always just thinking I wasn’t that important and that it wouldn’t mean much if the gesture in my head never happened. As I’ve gotten older, though, I realized how those little things DO matter. And they matter just as much whether you’re talking about someone you’ve known for years, or someone you saw in Starbucks or in yoga class. And, here’s the really important part … those thoughts in your head… I know this may come as a surprise, but people can’t read your mind. Unless you actually open your mouth and utter the words – in other words, TAKE ACTION, they have no idea what you’re thinking! I know! Shock! Right?? You might as well have never had those complimentary thoughts, because they’re living just in your head and not having the positive impact they could be having on someone else. Think about it in the reverse. Think about the last time someone gave you a compliment that really made you feel good. It could be someone at work, a friend, a significant other, or someone you just saw while you were out one day who complimented your shoes. Think about how that made you feel. Probably pretty good. It may have even turned your whole day around. Now imagine if that person just kept those thoughts in his or her head. There’s a chance your day might have gone in a totally different direction. There’s a reason people say pay it forward, and there’s a reason Marc Holzman talked about action. Action matters – and action matters most when it has a positive impact on another human being. So, I encourage you, next time you think about someone in a positive way, let them know. Give them a compliment. Send them a card. Drop them an email. Let them know they’re on your mind, and, I promise, you will do something positive for their mind. When I was in college, I had a job working at a bakery. Yes, me, who eats no sugar or dairy or eggs worked at a bakery. And I ate everything!! Pumpkin cheesecake for the holidays. Chocolate fudge cake with walnuts. And, my favorite of all… drumroll please… Carrot cake. This bakery had the most amazingly sweet and savory and moist carrot cake with cream cheese frosting. I would eat it slices, cupcakes, loafs, and was even known to polish off an entire cake by myself. Of course, this temporary enjoyment was usually followed by a stomach ache, a headache and a major sugar crash, which is essentially the reason for my diet today. Since I realized the cake, despite the temporary enjoyment it brought me, was not helping my overall well-being, I haven’t touched anything even remotely resembling carrot cake for years. 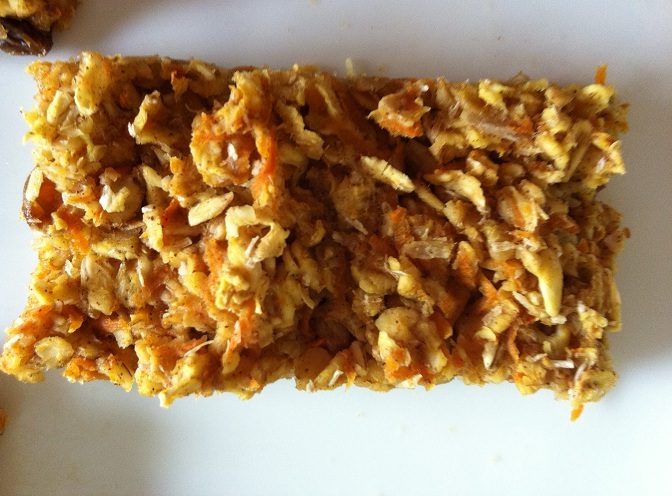 That was, until I found this recipe for Carrot Cake Bars that originated on the blog “the little things”. She has some awesome recipes, and, to be honest, I’m not even sure how I found this one. I can only assume I have Pinterest to thank. For real? A carrot-cake-like dessert that I could make easily and eat without questioning how my body would reac tto it?? Miraculously, I had them all. First, the oven. Preheated to 380 degrees. From there, I grated the carrots. Of course, I only had baby carrots so it took a little while. I would recommend using big ones and a cuisinart for ease of grating, but sometimes you just have to work with whatever you have on hand! Added the rest of the ingredientswith the exception of the water to the bowl, even adding a little bit of honey. Although, next time, I think I’ll probably plan ahead a little better and try not to be so impatient and use a paste from dates soaked in hot water and blended together as a sweetener in place of honey. But, again, that’s just me. If you like honey, grab that little bear and squeeze! I did make one other adjustment. Because of my coconut oil obsession, I added about a spoonful of that after adding the water. I think it might have also helped make it a little thicker. Next time, I might also try a little bit more cinnamon, and even considering some nutmeg. Press into a baking pan lined with parchment and bake for 20-25 minutes, or until top is slightly browned. If you can wait, let them cool and slice into bars. Of course, I couldn’t wait and ate a bar – or two – still warm and soft.